Happy Sunday everyone! 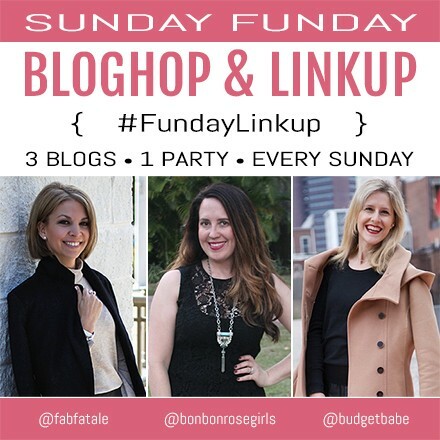 Welcome to the 1st edition of a new series we're dubbing the "Sunday Funday Bloghop & Linkup"! I'd like to start off by introducing my fellow hostesses and friends, lifestyle mavens Jennifer of Fab Fatale and Kristin of Bon Bon Rose Girls. These ladies inspire me daily, and we're hoping this new linkup series will inspire us all to, "try something new today"! What can you expect at 8 am every Sunday morning? Well, hopefully a whole lotta fun, meeting new people, and getting to know each other a little better. Bloggers, please share your "best of the week" post in the linkup below so that we can all see what you've been up to. Our fav linkup each week will be featured at Fab Fatale, Bon Bon Rose Girls, and The Budget Babe blogs in next week's Sunday Funday edition! Readers, please join in the fun by checking out all of the linkups below and feel free to leave us a comment to let us know what you think about our new bloghop party! Since this is our first edition and we don't have linkups to choose from yet, we plucked a few of our favs links from around the net for this first bloghop party. To welcome you to our first bloghop, we're giving away a pretty fun prize below. Bloggers, readers, and everyone in between are welcome to enter for a chance to win!